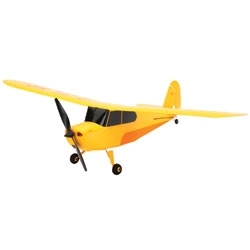 Teach yourself to fly RC airplanes in style with this exciting recreation of Aeronca’s beloved tail wheel airplane. Its small size and lightweight, durable construction let you fly with confidence in spaces as small as your own backyard without having to worry too much about crash damage. And it’s so easy to control you could be flying it like a pro in no time even if you’ve never flown an RC airplane before. The HobbyZone® Champ is also equipped with the Spektrum 2.4GHz DSM2® advantage: The Champ’s radio system uses the same Spektrum 2.4GHz DSM2 technology that is trusted by experienced RC pilots all around the world. With DSM2 technology you will enjoy complete freedom from signal interference whenever you fly. And after you teach yourself to fly, you can use the Champ’s transmitter to fly some of the Bind-N-Fly® ultra micro aircraft from ParkZone and Blade. Visit bindnfly.com to see which ones.